Over 700 plays by Shakespeare's contemporaries have been lost or exist only in fragmentary form, yet Elizabethan and Jacobean theatre continues to be understood exclusively in terms of plays that were printed or survived in manuscript. The purpose of this project is to add lost plays to scholarly discussions of early modern theatrical activity. The project achieves its aims through traditional print publications and through the innovative digital humanities platform, the Lost Plays Database (a wiki-style forum for scholars to share information about lost plays in Shakespeare's England, 1570-1642). The researchers believe that lost plays are a potential source of significant information on playwrights, playing companies, venues in London and the provinces, repertory studies, and audiences. The database provides a web-accessible, web-editable site for data on these plays concerning theatrical provenance, sources, genre, and authorship. The project is supported by an Australia Research Council (ARC) Discovery Project grant. Shakespeare figures prominently in our cultural consciousness, yet how much do we know about the theatrical marketplace of his period? This groundbreaking project changes our understanding of early modern English theatre by recovering information about the 700+ plays from the Jacobean and Elizabethan periods that have either been lost or survive only in fragmentary form. The project's chief investigator is Dr David McInnis of the School of Culture and Communication. He works in collaboration with Professor Emerita Roslyn L. Knutson of the University of Arkansas and Professor Matthew Steggle of Sheffield Hallam University. Dr McInnis is currently funded by an Australian Research Council Discovery Grant. He describes the importance of the project: "of the many, many plays written during Shakespeare's period, only a minority survive. A very important context for understanding what Shakespeare was doing is the lost plays from that period." A major part of the project is a website, the Lost Plays Database, which originated in 2009 and is hosted by the Faculty of Arts. It contains a wide range of information recovered about lost plays: titles, playwrights, playing companies, venues, audiences, and more. Dr McInnis explains that this research generates new perspectives on Shakespeare's life and times. "The more we recover, the more we see how much Shakespeare's plays have in common with other plays of the period … every play we look at is deeply embedded in a rich network of similar plays." In 2014, Dr McInnis and Professor Steggle co-edited Lost Plays in Shakespeare's England (Palgrave Macmillan) to bring together the latest research on lost plays. Professor Tiffany Stern (Oxford University) in the Times Literary Supplement describes this book as a "major achievement" that "defines a new field and gives it a shape, a nature and a range of critical approaches". Dr McInnis captures the transformative effect of this project. Before it began, "it was rare to hear anyone talk about lost plays at all. Now it is pretty much impossible to discuss Shakespeare and his contemporaries without at least mentioning that there are a huge variety of other plays related that we only know indirectly, that we get glimpses of occasionally." He is now working on a monograph to re-examine Shakespeare's career with lost plays as the vital context. 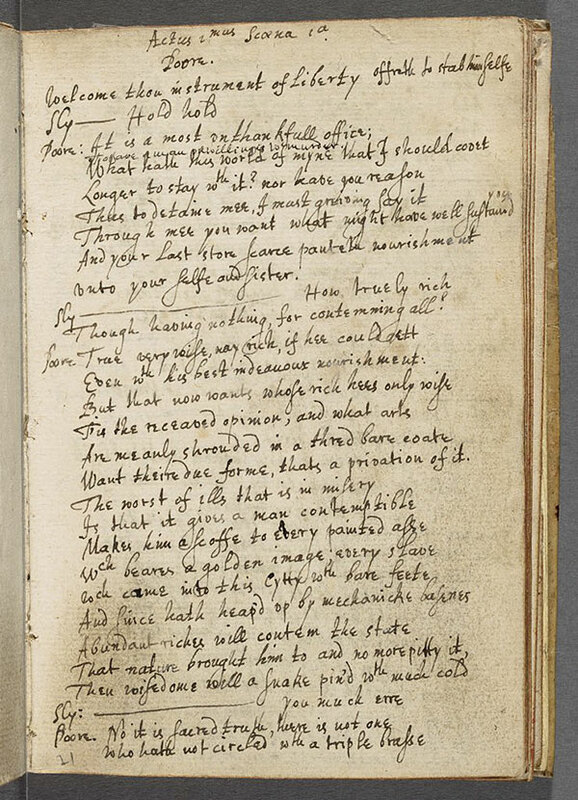 The 'part' of Poore", Houghton Library, MS Thr 10.1, f. 21r, reproduced by permission. The part of Poore, which provides the entirety of lines spoken by the play's main character, reveals much about the play's narrative, yet our knowledge is obviously limited by the relative paucity of other characters' speeches, which appear exclusively in brief cue lines and occasional false-starts cancelled by the copyist. David Carnegie offered a detailed conjectural plot synopsis, summarizing the evidence with further speculations based on clues within the part ("Play," 21-24). Broadly speaking, the "Play of Poore" was an academic comedy of subterfuge, disguise, and mischief. In the play's first scene, Poore enlists his fellow scholar Sly and the wench Gill to gull unwitting victims out of their money. One of the main plots has Gill, disguised as "Madam Change," presented as a marriage prospect for the foolish Trugull; Poore, disguised as the Yorkshireman "Change," objects that she is already betrothed to him, but agrees to withdraw his claim in exchange for payment; Sly, disguised as the corpulent uncle of "Madam Change," accepts her dowry. A subplot involves the cuckold Snaile, whose wife is coveted by two men, Medle and Quicke, whom Poore sets at odds until a duel leaves each convinced that the other is dead. Complications and confusions ensue, as Poore's mercenary opportunism results in the proliferation of overlapping cons. In the final scene, his machinations exposed, Poore feigns illness, but after making financial restitution to his victims, he reveals that he is well and everyone is reconciled." Misha Teramura (Harvard University), "Play of Poore," on the Lost Plays Database updated 07 October 2015 [Online] Cited 02/02/2016. Dr David McInnis, Gerry Higgins Lecturer in Shakespeare Studies, The University of Melbourne.